‘My customers want to recognise all the kinds of things that can only be seen from these unusual perspectives. The images are meant to arouse curiosity and amaze the viewer’, says Ralf Spoerer, the photographer from Wedel. But not only is Spoerer a photographer; you could also call him a pilot of sorts. In the past, aerial photography meant professionals had to pay for expensive helicopters or light aircraft fitted with large, expensive camera equipment. But now, small drones are taking off on individual photo flights with manageable costs and uncomplicated technology. If he was to achieve a truly fascinating impact with his photos, Ralf Spoerer needed a partner on his side – and a completely convincing print media solution that was capable of impressing even on the first test shots. ‘If my customers feel a twinge of vertigo when they look at the aerial photograph, I’ve done my job’, says Spoerer, getting to the heart of the demands on his work. ‘I also want to be able to produce the images myself on my Epson Surecolor P600. In discussions with Sihl I stressed that I need something that can pass through many hands without losing its lustre.’ Joint consultations then led to the decision to use the MASTERCLASS Lustre Photo Paper 300. Another decisive factor was that the high quality should be consistent throughout the entire imaging process. ‘We mainly use cameras with 24 or 36-megapixel sensors and for videoing we use 4K devices’, says Spoerer. ‘All edits are done using Lightroom or Photoshop, mostly from the raw files. The correct colour profile also helps when printing, as it ensures perfect prints are just a click away.’ The issue of quick, professional execution was thus another decisive factor in Sihl’s recommendation. Although Ralf Spoerer himself comes from the print sector, his real passion is shooting photography from dizzying heights. The Sihl-Team recommended Masterclass for the ‘Flying High’ project with Ralf Spoerer because this product satisfies all of these requirements. Ralf Spoerer is excited about the RTF concept (ready to fly). ‘It means I can now control four small drones and two large Hexa-copters straight from the box.’ High-power lithium-polymer batteries allow for flight times of around 15 minutes and with the help of an integrated GPS system they can be controlled right down to the exact position. The drones are fitted with a so-called Gimbal, which balances the movements on the drone thanks to control commands and thermal currents: the camera is steady at all times, so it cannot shake or produce unfocussed pictures. Photographs shot by the camera are then sent by radio directly to the pilot’s screen. ‘This allows me to measure the exact perspective, distance and cut’, explains Spoerer. Aerial photography is demanding and requires the appropriate equipment and know-how. For this reason, not only is Ralf Spoerer a professional aerial photographer but he also passes on his knowledge to others in his ‘Drone College’ workshops. What seemed impossible just a few years ago is reality today: high quality aerial photographs taken from between 20 and 40 metres above the ground in excellent quality. The latest drone devices are so small that they can even take off from the user’s wrist and can produce sophisticated selfies. 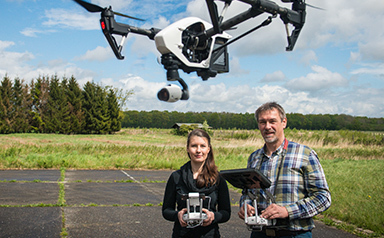 Photographers like Ralf Spoerer are now increasingly entering this sector following the drop of around €10,000 in investment costs for the new generation of flying equipment about two years ago, making them more affordable (Spoerer uses the Phantom 2 Vision). The ‘Living Rooms’ project – a purposeful sensory illusion by Sihl and the ‘a-ja’ resort brand.